Ambrose Alli University, AAU Ekpoma acceptance fee payment schedule for the 2018/2019 academic session. The authorities of the Ambrose Alli University (AAU), Ekpoma has announced the amount payable as acceptance fee by the 2018/2019 academic session newly admitted students. 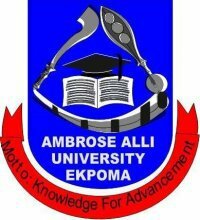 The authorities of the Ambrose Alli University (AAU), Ekpoma has released the acceptance fee amount and payment procedure for all the candidates offered admission into the university DEGREE programmes for the 2018/2019 academic session. AAU Ekpoma Acceptance Fee Amount. AAU Ekpoma Acceptance Fee Payment Procedure. Click “My Data” tab at the top of the Page, click “payments”. Click on the Add Online Payment Ticket button. Under Category: Select the appropriate payment item (i.e: acceptance fee). SEE ALSO: AAU Ekpoma Fresh Students Registration & Clearance Procedure for 2018/2019.